For a business with international reach, acting sustainably and responsibly is key to achieving economic performance. The OENEO group is committed to an everyday social responsibility policy. 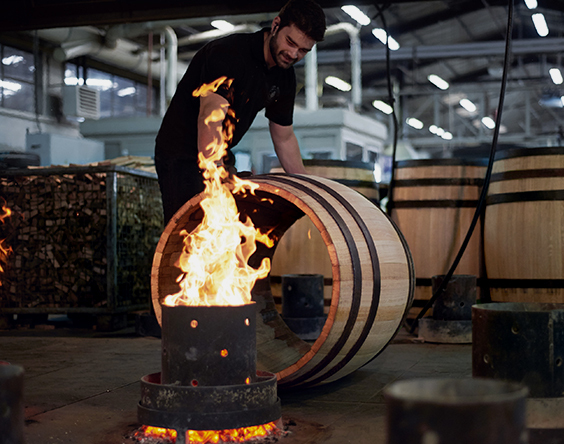 As such, sustainable development is the cornerstone of the bond that the men and women of our group forge with the natural materials we need to develop our barrels and closures. This commitment is illustrated through the various actions we have carried out over the past year to promote responsible development in everything we do. We constantly strive to improve both the working conditions and the health and safety of our employees. We believe that responsible management of the environment and forests goes hand in hand with the development of our business and our innovations. We believe that if we provide our clients with high-end products of exceptional quality, we can offer impeccable products to our final consumers. We believe that a political and economic strategy must be transparent and ethical. Relationships between stakeholders and the OENEO group are based on trust. Transparency and honesty must be paramount in employee behaviour. The laws and regulations in force must be respected in all countries where the group is present and the fight against corruption must be at the forefront of stakeholders' minds. In terms of procurement and selection of service providers, the group provides specifications and organises tenders, whenever required by the scope of the project. The group always calls upon a number of suppliers to request a range of quotes, in order to compare the price-performance ratio in a complete and exhaustive manner. It compares objective criteria and strives to remain impartial. The group's commercial policy defines the negotiation margin available to each member of the team for his or her client portfolio. Commercial relations are supervised by weekly and monthly reporting, personalised follow-up with the in-field sales representatives by their line manager, as well as an annual overall performance review. Our commitments are geared towards sustainable business, which is the only guarantee for long-lasting success in our areas of expertise. As such, all of our entities are committed to our CSR policy. Avec l’acquisition de la certification PEFC, la maitrise de ses rejets (contrôle, recyclage, réutilisation, réduction), de ses consommations (interrupteurs par zone…) et de nombreux engagements (certification ISO 22000 obtenue en 2017, analyse du cycle de vie de produit entamée) la société confirme son bon vouloir et sa constante évolution en matière de durabilité. Driven by the values of sharing and equality, the Vivelys group chooses to work with companies that specialise in the recruitment and integration of people with disabilities. Equally concerned with the well-being of its teams, the Boisé site renewed and increased the capacity of its dust extractors this year. Seguin Moreau has been committed to a CSR approach for the past decade and is attentive to its responsible development. It supports this objective by taking numerous positive socio-environmental actions: certification policy (PEFC, ISO 22000), consumption control (with the biomass boiler), waste control (recycling, re-using, reducing), environmentally-friendly actions (carbon neutralisation), etc. The implementation of the eco-responsible dust extractors came at the same time as voluntary membership to the United Nations Global Compact in 2007. In becoming a member, Seguin Moreau acts as an ambassador of the Compact’s ten founding principles. Continuously upholding its values of sharing and equality, the Seguin Moreau group has forged a partnership with workshops that help workers with disabilities to carry out certain subcontracting services. Fully aware of what the environment has to offer, Diam has made environmental commitment the key to its success, and its actions go beyond regulatory and conventional requirements. As a holder of numerous certifications, Diam regularly monitors the evolution of its carbon footprint. Now, it is taking it a step further by analysing the Diam and Mytik closures’ life cycles. These indicators allow the company to implement action plans with the view to reduce greenhouse gas emissions. Diam is also a major player in the positive development of cork oak forests, especially in France. In addition, the willingness to participate actively in society and the notion of respect are important for Diam. Therefore, these elements are reflected in the many different partnerships that the company has forged and nurtured. Most of these partnerships are designed to benefit adults (NQT, ELISE, Paralympic Games, etc.) and children (ELA Association) with disabilities or special needs. The Piedade group strives to achieve sustainability in all phases of the process, from the origin of raw materials (forests) to the entire waste management process. With cork, nothing is lost; everything is transformed. Eager to establish a fair and cordial relationship with all its stakeholders, whilst preserving the culture of the regions where it operates, the group is driven by sustainability and guarantees the best possible relationship with everyone involved.